Dr. Jacono recommends that his injectable patients start taking J PAK System No. 1 one day prior to their procedure and four days after. 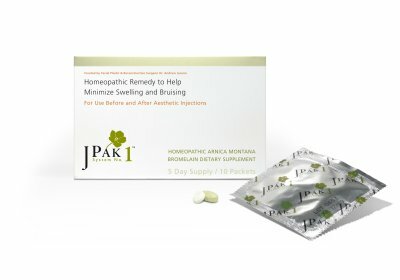 High Potency Arnica Montana, a perennial herb, indigenous to Central Europe that has long been used to reduce post-traumatic bruising and swelling. Bromelain, an enzyme derived from pineapple stems shown to reduce edema (swelling) and ecchymosis (bruising) following surgical and non-surgical trauma to the face. Plan ahead! To order, click here.